Hi. I'm Guangcong Luo. I develop software, both desktop software and Web applications. Here's some of the work I've done. You may also wish to see my resume; it is available at: guangcongluo.com/GuangcongLuoResume.pdf. These are projects that are completely or mostly my work - since some of them are open-source projects, others have contributed various things, but everything major was done by me. Pokemon Showdown! pokemonshowdown.com By far my largest project. 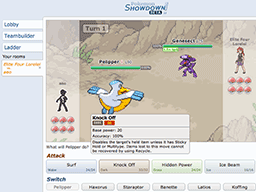 An online Pokemon battle simulator. Did everything: UI, graphics engine, game engine, website, authentication system, and scaled it up to handle thousands of concurrent users. 9 million visits/month, 20000 peak concurrent users, 1300 GitHub forks. Filecharger filecharger.com An online file manager with an easy-to-use interface. QuestionMark AI qmarkai.com A chat bot that answers your questions, be they "Who is God?" or "What is the meaning of life?". Intended to be a smarter Magic 8-Ball. I made the original version when I was 13. Warzone 2100 wz2100.net A real-time strategy game where the player commands the forces of "The Project" in a battle to rebuild the world. I was a developer for Warzone 2100 from 2009 to 2011. I maintained game balance and documentation (see above), and have contributed artwork, AI improvements, interface improvements, documentation, and many bugfixes. My Github username is also Zarel, although few of my projects are currently there. Pokemon Showdown is, though. I've submitted a few bug patches to open source projects on Github, when I've encountered problems with using them.